Caracol or El Caracol is the name given to a large ancient Maya archaeological site, located in what is now the Cayo District of Belize. It is situated approximately 25 miles south of Xunantunich and San Ignacio Cayo, at an elevation of 1500 feet (460 m) above sea-level, in the foothills of the Maya Mountains. 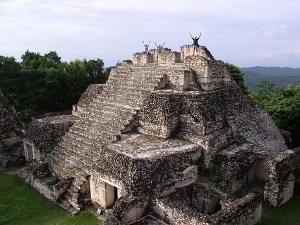 The site was the most important political centre of Lowland Maya during the Classic Period within Belize. On the way to Caracol, you will have to drive the the Mountain Pine Ridge Reserve. This is a wonderful place full of trails and water falls. It’s well worth it to add a jaunt through the park on your way back.